As any regular readers will know, I cook with pork cheeks a lot. They taste fantastic when slow braised, and are very forgiving in terms of cooking times thanks to the abundant connective sinew which melts and moisturises the meat during cooking - plus they’re great value and freeze very well, meaning you can stock up when you see them. They work fantastically well in a lot of different slow cooked dishes, one of which is this traditional Italian slow cooked ragu. 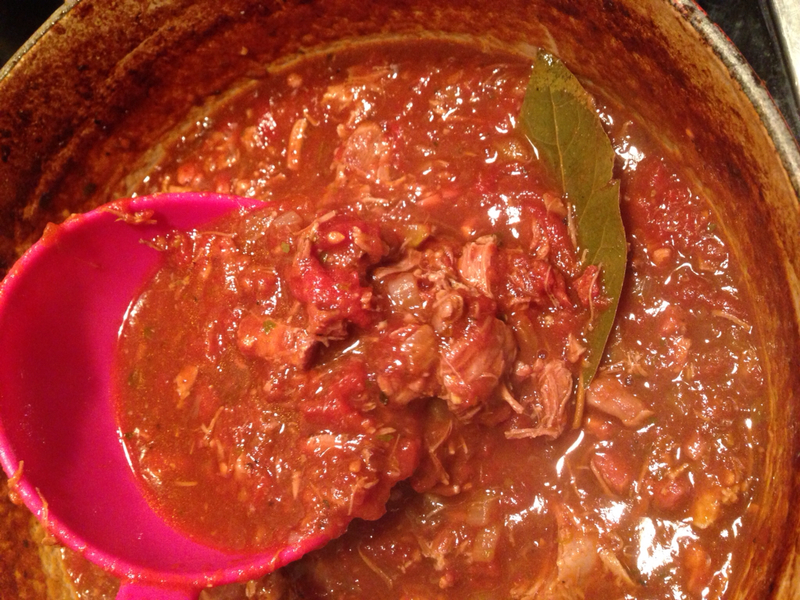 Pork cheeks have a slightly stronger piggy taste than some other cuts which really gives some guts to this dish, with the meat shredding beautifully to create a deeply meaty, intensely flavour packed sauce which makes a feast of freshly boiled pasta. Different cuts of meat could be used, such as a pork shoulder, shin beef, or even lamb, but don’t be tempted to replace chunky cuts for mince to save time, it won’t be the same. 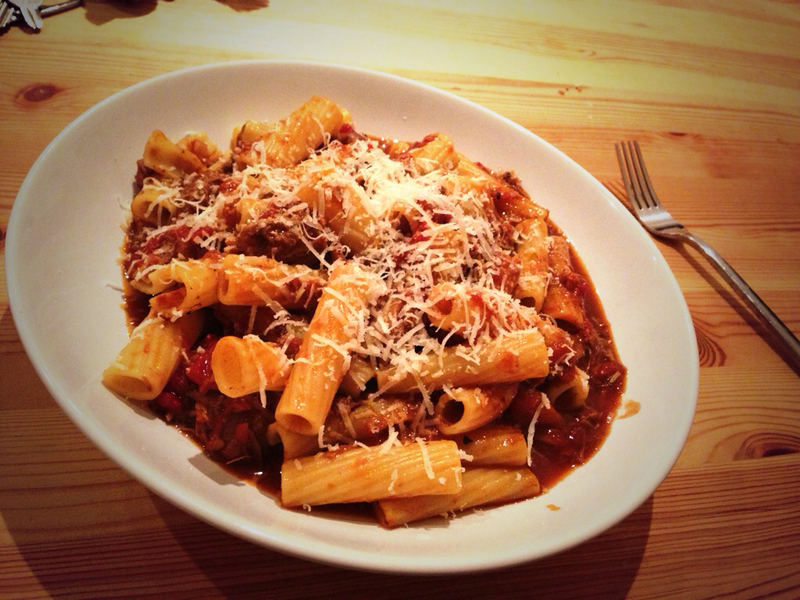 Run-of-the-mill spag bol this aint, and trust me it's worth the wait. Start by browning your pork cheeks in a generous glug of olive oil over a medium-high heat, in an oven proof casserole dish, then remove from the pan and set aside in a bowl. Next throw in the pancetta and fry until crispy but not crunchy, then remove to the bowl with the pork. Next add the onion, celery and carrot along with a good crack of salt to help the veg sweat out their juices. Once the veg is soft but not browned pour in the wine and allow to bubble for a minute, scraping any brown bits from the bottom of the pan. Next add the pork and pancetta (along with any resting juices) back to the pan along with all of the other ingredients, including a good twist of salt and black pepper. Stir, cover and transfer to the oven to cook for 3-4 hours at 160*C. Once the pigs cheeks can be easily squashed with a spoon then they are cooked, so test them after 3 hours but give them longer if they need it – it’ll be worth the wait. 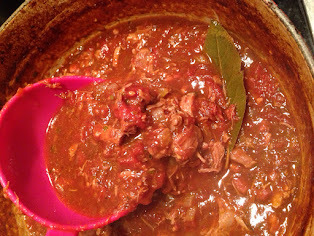 Once the cheeks are cooked place the casserole dish back on the hob and squash the pigs cheeks and tomatoes with a wooden spoon (or lift out and chop), before simmering uncovered to allow the sauce to thicken slightly. Whilst the sauce thickens cook around 400g of pasta in plenty of salted boiling water - jumbo ribbons of papardelle is traditional but I’ve found rigatone’s fat tubes to work well too. When the pasta is cooked give it a very quick drain before chucking it into the sauce and combining well. Serve immediately in large pasta bowls with a generous grating of parmigiano reggiano or pecorino romana Italian hard cheese. A medium bodied, fruity red wine such as a good chianti would work well and is a traditional pairing, but I opted for a bottle of St Peter’s Ruby Red Ale which worked extremely well too. You need some malt character in there somewhere when pairing with tomato, but a little bit of spicy/herbal hop flavour and aroma dovetails nicely with the herbs and pork, making this beer a great bedfellow for this ballsy dish. Sounds really tasty Neil. I must say though, I don't believe I've ever seen pig's cheeks in a butchers. We have a good local one mind you, so I could ask. What should I be paying? I actually get mine from Morrison's, either from the meat section or by asking at the butcher's counter. They probably have them in stock two thirds of the time so your chances are good (both up north and down here I might add). Morrison's charge between £5 and £6 a kilo if my memory serves. If buying from your butchers make sure you ask for trimmed pork cheeks, you dont want the entire jowl as there is a lot of fat and other tissue you'll have to chuck away anyway. When I do it, I'll let you know how it goes. I found this to be very tasty but some parts of the meat had an off-putting “glibbery” texture. The second time I made it I looked at the cheeks more carefully and trimmed off the unpleasant bits. What kind oh wine should I use for cooking?